Abhyangam is an ancient Ayurveda massage therapy where special herbs infused oil is warmed and gently massaged into the skin. The massage deeply relaxes, detoxifies, strengthens and revitalizes the whole body leaving you stress free and relaxed. Mukha Lepanam is an ancient Ayurvedic therapy where the face is massaged with herbal beauty oils or natural herbal cream. It is known to prevent skin aging and enhance skin elasticity. There are several other detox and beauty packages on offer here. Masala! 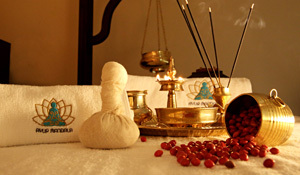 and Ayur Mandala Ayurveda Center have joined hands to offer you a body therapy. Enjoy a 60 minute full body Ayurveda massage or an Ayurvedic facial therapy, by answering the questions below.